The Toshiba Strata CIX line of digital VoIP hybrid business telephone systems comes in sizes designed to meet every need and every budget. All Toshiba telephone systems come with Toshiba’s industry renowned performance and reliability built in. Download the Toshiba CIX eBrochure. CIX-670 – supports up to 672 ports for users requiring 30 to 560 telephones. CIX-100 – supports up to 112 ports for users requiring 8 to 72 telephones. CTX-100-S (discontinued) – supports up to 16 ports, and is expandable to full Strata CIX 100 capacity. CIX-40 – supports up to 16 digital phones, 11 outside lines with free Caller ID, 24 VoIP phones, and two analog ports. Whether you need a basic reliable business telephone system or a sophisticated high end telephone system with advanced capabilities, like VoIP, SIP, DID, and ACD, the Toshiba CIX line of digital VoIP hybrid telephone systems will work for you. Toshiba provides your business with the flexibility you need from a telephone system. The Toshiba CIX can easily adapt to your changing and growing needs. The Toshiba Strata CIX telephone system is specifically designed to provide the exact telecommunication features your business requires today, and as it grows in the future. Starting at 3 phones and growing to over 500, the Strata CIX is the ultimate cost-effective telecommunication solution to give you the investment protection you need. 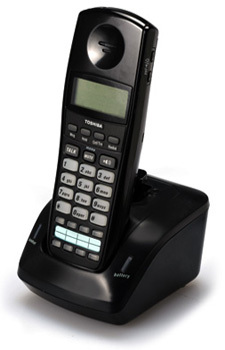 Toshiba digital telephones are both stylish, user friendly, and efficient. Their exceptional functionality and ease of use ensures your employees will maximize the benefits of the system’s many features, improving both internal and external communications. Toshiba features a wide range of digital telephones and consoles, allowing you to mix and match your telephones to your specific application. 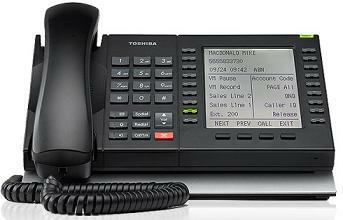 All Toshiba telephones are compatible with all Toshiba systems, even if you upgrade to a larger telephone system. Plus, proven Toshiba quality and reliability are built into every telephone we offer. Each model is rigorously tested in real-world conditions, so you can depend on your Toshiba digital telephone system’s performance day-in and day-out. 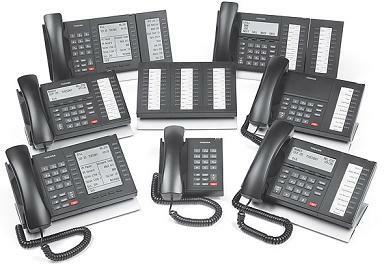 With a sophisticated, high tech look, Toshiba telephones come in a variety of 10 and 20-button models. All have speakerphones and come with or without LCD displays. Some come with back-lit displays and keypads and fill duplex speakerphones are available. Basic analog phones are also available for warehouses or factory locations. New, high tech DECT digital cordless telephone and Wi-Fi IP Cordless telephones meet your needs for mobility within the office. There are 10-Button & 20-button add-on modules, 10 button desi-less add on modules, and a 60-button receptionist console that are ideal for small/medium volume answering requirements. The Strata CIX Attendant Console is the most effective solution for specialized high-volume call answering. User-friendly Windows interface and streamlined functions make high-volume call answering faster, easier, and more efficient. VoIP phones come in both 10 and 20 button sizes. They can connect workers across your LAN or WAN or anywhere there is an internet connection. Soft phones can even connect you on your laptop or desktop. Toshiba supports proprietary multiline soft phones or generic SIP softphones like X-Lite. Toshiba VoIP telephones give you access to all features including intercom, off-hook call announce, paging, caller ID, music on hold, and more. The Toshiba Strata® CIX IP communication system helps you keep your customers connected and employee productivity at its peak. This versatile system supports many types of mobility endpoints and devices, including Toshiba’s SoftIPT soft phone for notebook computers and PDAs, wireless IP telephones, and cordless telephones. Cordless Telephones; Stay Fully Productive While On The Go! Share the same station port and extension number with your desk phone. Switch between your cordless and digital desk phone even during a call! • LCD Feature Prompting with Soft Key Operation: Provides easy-to-follow instructions and eliminates need for station users to remember access codes or operational sequences for commonly used features. • E-mail Integration: Get a copy of your voice mail sent to your email or even your cell phone. • User Programmable Feature Buttons: Users can program their own buttons to automatically perform a sequence of feature operations at the touch of just one button. • Auto Busy Redial: Allows station users to automatically have their telephone redial a busy outside number. • Modular Growth and Expansion: Allows system expansion in a building-block process. You simply add features and components as needed and telephones are compatible throughout the entire CIX product line. • Least Cost Routing: Directs each outgoing call using the least costly line or common carrier connected to your telephone system, reducing the cost of long distance calls. • Toll Restriction: Enables you to control employee access to long-distance calling. You can limit designated station users to making only toll calls that are necessary for their job performance. • Battery Backup: The Strata CIX power supply is standard-equipped with a battery charger and the batteries continuously trickle charge optional back up batteries to capacity while electrical power is present. • Direct Inward Dialing (DID): Routes incoming calls directly to specific stations without going through a receptionist or an automated attendant. • Multiple Directory Numbers: Extension numbers can appear on multiple telephones and individual telephones can have multiple station extension numbers, maximizing call coverage flexibility. • Dialed Number Identification Service (DNIS): Route incoming calls exactly where you want them to go according to the number dialed. LCD display information identifies the type of call and the number dialed. • Caller ID: Displays the caller’s name, telephone number, and customer profile from your database (with CTI applications). You won’t miss important call information even if you can’t answer the call and the caller doesn’t leave a voice mail message. You can even use speed dial to return calls from the call history list. • Off-Hook Call Announce: Ensures that employees receive important telephone calls by allowing the intercom to call a busy station user. Call announcements can go through the handset or the telephone speaker. • Easy System Programming: CTX WinAdmin and CIX Network eManger software runs on your PC or Laptop, making system programming and administration fast and easy. CTX WinAdmin and CIX Network eManager provides full programming for technicians and system administrator level programming for end users. • Remote Maintenance: Allows off-site service personnel to alter system programming and test hardware from remote locations either via IP or dial-up. • SmartMedia Card: This is a removable memory card that is commercially available in retail stores. It is the same as SmartMedia cards used in digital cameras and MP3 players. The Strata CIX uses the SmartMedia card to store all error and trace logs, the system operating software, and the customer database. The SmartMedia card is inserted into a dedicated socket on the CIX processor. The CIX processor creates and labels files onto the card for all maintenance functions. These files can be moved, copied, or e-mailed using PCs equipped with a SmartMedia card adapter. • Automatic Fault Recovery: The system can automatically correct certain conditions detected during operation. This enables the system to continue operating normally without requiring immediate correction. • Backup/Restore: The customer database can be backed up and restored using the SmartMedia card. The customer database is a file that can be stored on the SmartMedia card, transferred to the PC hard drive, e-mailed, etc. • Maintenance and Administration via LAN: CTX WinAdmin and CIX eManager can be connected to the Strata CIX telephone system via your local area network (LAN) as well as remotely via modem over the public telephone network. • Software Upgrade: All Toshiba Strata CIX telephone systems can be upgraded using the SmartMedia card or via upload from a remote location. The operating software is a file that can be stored on the SmartMedia card, transferred to the PC hard drive, e-mailed, etc. No hardware is required and best of all Toshiba provides upgrades for their business telephone systems for free. A contact center doesn’t have to be complex to be powerful, and Toshiba’s Strata® CIX™ is simplicity at its finest. Running as an application on the Strata Media Application Server, a robust array of Automatic Call Distribution (ACD) features makes it easy to manage inbound calls, optimize contact center operations, and increase customer satisfaction. A well-managed contact center can serve customers quickly, efficiently, and cost-effectively, providing an important competitive advantage to a business of any size. IVR Voice Assistant gathers and validates caller input, triggers responses, alerts agents and supervisors when the queue gets overloaded with calls, and provides many creative application opportunities. Integration of your PC and your telephone enables you to manage incoming and outgoing call functions and synchronizes with your company’s operations, CRM or contact software. Network ACD applications enable multi-site contact centers to work together as one call routing system. Network ACD distributes agents over the network and routes calls to available agents on any CIX system on the network. Network ACD checks the status of agents in other nodes before routing calls to those agents. The call center reports include agents and calls over the network, and helps Net Phone support features such s Network DSS/BLF and/or Chat between users in multiple nodes. Even more advanced features give customers additional ways of contacting your company. Web Chat enables online customers to initiate an instant messaging chat session with a contact center agent. By providing their name and number on a website, online customers can also request a “call back”. When a representative becomes available, this Strata ACD application automatically calls the customer. Multimedia Web Callback provides better customer service, reduces hold times and helps reduce contact center operation costs. Routes callback requests to different ACD groups based on information entered, such as callback number, extension, name, subject, notes, etc. Filters duplicate callback requests to the same callback number and extension. Limits number of web callback requests in ACD queue. Separates initial queue priority for web callback request. Supports virtual ACD queue (no corresponding Strata CIX pilot DN). Supports web callback counting similar to regular callback counting in TASKE and Insight. Includes additional web callback statistics reports. Strata Call Manager can show user information such as name and/or subject collected on the web page when the callback request is made to an agent. Ready-made web widget provided (includes source codes for ASP.NET, JAVA, and PHP). A basic Web callback widget can be used or the widget can be customized for customer’s web server environment. Most types of browsers are supported, including Mac. With Toshiba’s call center applications, your call statistics and management reports and live monitoring displays are conveniently accessible online. View live displays and customized reports on everything from call statistics and agent performance to forecasting tools, auto reports, and more using any of several PC-based reporting solutions that are ideal for use with ACD applications. Call recording/logging enables you to record, store, organize, search, and playback telephone calls to avoid call disputes and improve the quality of training and customer services. Avoid communication disputes with Tracer, a CTI enabled digital call recording/logging system. Calls are recorded from start to finish, and Tracer automatically inserts bookmarks in every recording whenever calls are transferred or put on hold. When used together with Strata Call Manager, users have the ability to start and stop recordings or insert bookmarks at important points in a call. Tracer can also help improve your business operations, including training, quality control and customer service. Tracer Replay, included with Tracer, lets you to easily manage your call recording and retrieval functions. Replay streams the audio from wherever the recording is stored and allows searching by any collected information criteria. End to end recording captures every second of the call, even while the caller is on hold. Look-Back Recording records an entire conversation, even if the recording was started after the call began. Call Monitoring allows authorized users to listen to calls live as they’re happening, whether those calls are being recorded or not. Selective Recording records specific or random extensions, groups of extensions, or every extension. Toshiba is all about flexibility to meet your needs. Increase your company’s productivity, efficiency and customer satisfaction with Toshiba’s Strata CIX Dgital IP hybrid telephone systems. The Strata CIX offers range of practical solutions that can enhance service, reduce abandoned or missed calls and improve knowledge across your organization. Extend full-featured desk phone functionality to remote users anywhere via IP telephones connected to your private intranet or the Internet. Reduce costs by transmitting voice calls via the Internet or your private intranet. Provide one integrated system for all your office locations by networking multiple Strata CIX systems to work together as one system. Networking features include Centralized Voice Mail and Attendant, SMDR, and Station DSS button appearances across all nodes. Alternate Routing provides for toll bypass configurations and automatic recovery from network disruptions. Combine the capabilities of your computer and telephone into one powerful unified communication tool. Call control from your PC lets you dial, answer or transfer calls, and more, using your mouse without picking up the telephone. Toshiba’s Strata Call Manager can be used in conjunction with an IP or digital business telephone to provide desktop call control. It can also be used as a stand-alone IP soft phone, providing mobility and remote access, and synchronizes with a company’s operations, CRM, or contact software. Outbound dialing from any application is easy. Launch documents, applications and web pages from the Strata Call Manager interface. ACD login/logout, supervisor functions and ACD Viewer through built-in integration with Strata ACD Recording control through built-in integration with OAISYS® Tracer products. Call recording and logging systems record, store, organize, and play back telephone calls, avoiding communication disputes. Recording applications also help improve the quality of your business operations, from training and quality control to customer service. Cradle to Grave Recording captures every moment of the call, even while the caller is on hold. Look-Back Recording records an entire conversation, even if the recording was initiated after the call began. Call Monitoring allows authorized users to monitor calls as they’re happening, whether those calls are being recorded or not. Selective Recording records specific or random extensions, groups of extensions, or every extension. After-Call Actions can be taken after a call, including sending an e-mail or instant text message, or launching another program. Toshiba’s Strata® Media Application Server (MAS) integrates with Strata CIX™ IP telephone systems to host a variety of value-added unified communication applications within one platform. Reducing the need for multiple servers, the Strata MAS dramatically decreases cost and complexity. Available in two models, the MAS (4-32 ports) and MicroMAS (2-8 ports) are compatible with all model Strata CIX systems, providing a comprehensive and integrated solution that fits every size business and every budget. Toshiba’s FeatureFlex™ adaptability and customization tool, Strata® CIX™ IP telephone system, and Integrated Media Applications Server (MAS), let you tailor your telephone system far beyond standard options and features. FeatureFlex lets users modify virtually any existing features and create new ones. And not just CIX call processing, but blended features that work between all system applications and resources including voice mail and CTI applications.. A simple script editor works with the Media Application Server to interpret code, process functions, and follow custom routing. Create new functions in just hours, not months or years waiting for the next software release. Connect with back office systems, and allow important information, such as inventory management, to scroll across the phone or screen. Connect with online sources for reference information, such as stock prices, weather temperatures, currency valuations, and more. Set up call management features, such as follow-me routing that forwards calls to another number. It can also route calls from unknown callers (or any designated callers) directly into voice mail. • Strata CIX telephone systems include Toshiba engineering innovations that provide superior reliability compared to similar-sized systems, assuring top performance day in and day out for an average of 10 to15 years. • Large Scale Integration (LSI) technology makes circuit design compact and efficient. More circuitry fits onto smaller circuit cards for a more compact design, minimizing AC power requirements and generating less heat. This maximizes product life and reliability. Toshiba is industry renowned for longevity and reliability. • Strict design standards are used by Toshiba world class engineers. Components are selected only after they are thoroughly evaluated for performance in high temperatures and other severe conditions affecting reliability. Before manufacturing, all equipment undergoes a series of proprietary tests that analyze environmental, EM, electrostatic, and stress factors. • Built-in power surge protection is provided by the Strata CIX’s switching-type regulated power supply that provides line filtering and is protected by circuit breakers that can be reset. This design assures that the Strata CIX has one of the most reliable power supplies available. • Built-in gas tubes on ground and loop start CO line cards help provide secondary protection of each circuit from lightning and other power surges. • Stored program control keeps all programming, option settings, and customer database information in Random Access Memory (RAM). A lithium battery in the CPU, with a life span of at least six years, preserves RAM when AC power is unavailable. There is no volatile memory loss and no need for external memory storage components. • Since there are no moving parts, stored program control data is much safer and Strata CIX systems are much more reliable than systems using disk drives to store data. The absence of moving parts also reduces heat generation, resulting in longer life and greater reliability and lowers electrical consumption for lower cost. • Toshiba Strata CIX telephone systems represent state-of-the-art technology at its best. Strata CIX is designed using the latest technology, including SIP trunks and SIP stations, MEGACO VoIP multiline telephones, and automatic call distribution, to provide configuration flexibility and optimum operation. • The Strata CIX uses a high-speed 32-bit RISC processor, DRAM working memory, SRAM with lithium battery for back-up memory, and SmartMedia flash program memory. • The SmartMedia flash card stores program memory and makes it easy to download memory as well as upload program memory. Better yet, it makes future software upgrades easy without replacing memory chip hardware. • You can upgrade system features and capacity as needed. Flexible “building block” design allows upgrading and growth at minimal expense. • The system features universal slot architecture that allows you to create almost any combination of trunk lines, telephones, and peripherals. • Other systems’ “new” technology is old compared to Toshiba Strata CIX telephone systems. • Digital technology is used to balance the volume for multi-party conference calls. • The Strata CIX processor is equipped with a network connection for both local and IP administration. • Strata CIX supports today’s high-demand trunk interfaces using VoIP, SIP, and ISDN technology. More SIP trunking partners are being certified every month, so even if your SIP carrier isn’t listed here, it may be certified. Non certified carriers may still be compatible, but since SIP trunking is a very new technology and is not a completely standard protocol, it is best to use a certified carrier.